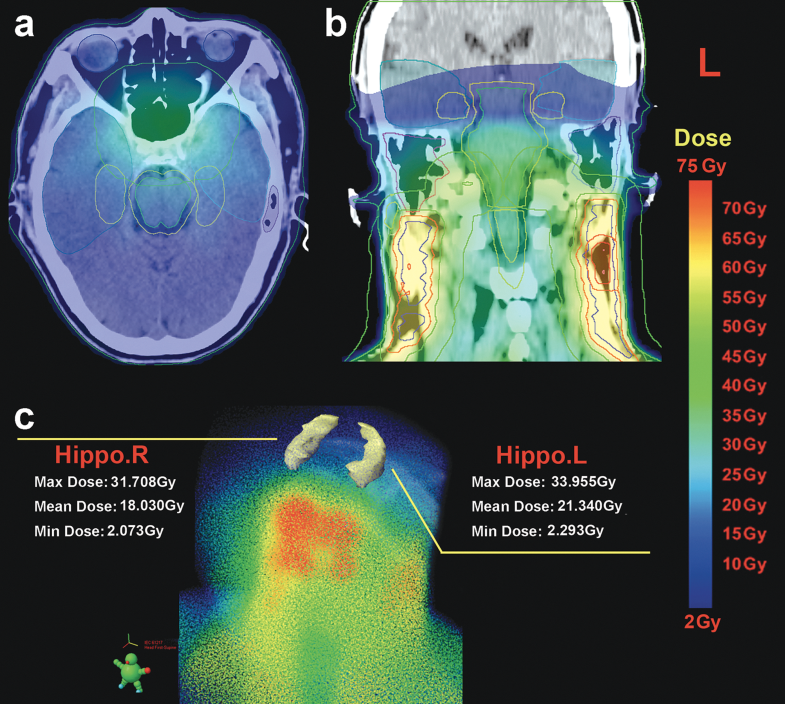 Increasing evidence indicates that radiation-induced injury to the hippocampus may play a critical role in neurocognitive dysfunction in patients with nasopharyngeal carcinoma (NPC). However, few studies have assessed RT-induced hippocampal structural alterations in these patients early after radiotherapy (RT). In this study, 58 NPC patients were longitudinally followed up prior to treatment initiation as well as 3 and 6 months after RT, respectively. Twenty comparable normal controls were recruited and followed up in parallel. A novel magnetic resonance imaging (MRI)-based automated method was used to label hippocampal subfields. The linear mixed model was employed to evaluate longitudinal changes in the volumes of the whole hippocampus and seven hippocampal subfields. Time-dependent volume reduction was observed in the bilateral hippocampus, as well as in the bilateral granule cell layer (GCL), bilateral cornu ammonis 1 (CA1), bilateral molecular layer (ML), and bilateral subiculum (SUB) in NPC patients, but not in controls. Moreover, volume deficits in the bilateral hippocampus, bilateral GCL, and right ML showed dose-dependent patterns, and high volume losses in the bilateral hippocampus, bilateral GCL, left SUB, and right ML were associated with a rapid decline in cognitive function. Our findings demonstrated that the hippocampal subfields were selectively injured by irradiation-related early neurotoxic effects, which might account for cognitive impairment in NPC patients at an early stage after RT. Further, structural MRI could serve as a potential noninvasive imaging biomarker for the early detection of radiation effects on the hippocampus in NPC patients after RT. Xiaofei Lv, Haoqiang He and Yadi Yang contributed equally to this work. The online version of this article ( https://doi.org/10.1007/s11682-018-9931-z) contains supplementary material, which is available to authorized users. This work was funded by grants from the Natural Scientific Foundation of China (grant numbers: 81401399, 81560283, and 81201084), Natural Scientific Foundation of Jiangxi Province, China (grant number: 20151BAB205049), Fundamental Research Funds for the Central Universities (Grant number: 15ykpy35), and Medical Scientific Research Foundation of Guangdong Province (Grant number: B2014162). Cao, B., Passos I. C., Mwangi B., Amaral-Silva H., Tannous J., Wu M. J., et al. (2017). Hippocampal subfield volumes in mood disorders. Molecular Psychiatry, 22(9), 1352–1358. https://doi.org/10.1038/mp.2016.262. Chapman, C. H., Nagesh V., Sundgren P. C., Buchtel H., Chenevert T. L., Junck L., et al. (2012). Diffusion tensor imaging of normal-appearing white matter as biomarker for radiation-induced late delayed cognitive decline. International Journal of Radiation Oncology, Biology, Physics, 82(5), 2033–2040. https://doi.org/10.1016/j.ijrobp.2011.01.068. Chen, S. C., Abe Y., Fang P. T., Hsieh Y. J., Yang Y. I., Lu T. Y., et al. (2017). Prognosis of hippocampal function after sub-lethal irradiation brain injury in patients with nasopharyngeal carcinoma. Scientific Reports, 7(1), 14697. https://doi.org/10.1038/s41598-017-13972-2. Decker, A. L., Szulc K. U., Bouffet E., Laughlin S., Chakravarty M. M., Skocic J., et al. (2017). Smaller hippocampal subfield volumes predict verbal associative memory in pediatric brain tumor survivors. Hippocampus, 27(11), 1140–1154. https://doi.org/10.1002/hipo.22758. Ding, Z., Zhang H., Lv X. F., Xie F., Liu L., Qiu S., et al. (2018). Radiation-induced brain structural and functional abnormalities in presymptomatic phase and outcome prediction. Human Brain Mapping, 39(1), 407–427. https://doi.org/10.1002/hbm.23852. Farjam, R., Pramanik P., Aryal M. P., Srinivasan A., Chapman C. H., Tsien C. I., et al. (2015). A radiation-induced hippocampal vascular injury surrogate marker predicts late neurocognitive dysfunction. International Journal of Radiation Oncology, Biology, Physics, 93(4), 908–915. https://doi.org/10.1016/j.ijrobp.2015.08.014. Ghia, A., Tome W. A., Thomas S., Cannon G., Khuntia D., Kuo J. S., et al. (2007). Distribution of brain metastases in relation to the hippocampus: Implications for neurocognitive functional preservation. International Journal of Radiation Oncology, Biology, Physics, 68(4), 971–977. https://doi.org/10.1016/j.ijrobp.2007.02.016. Gondi, V., Pugh S. L., Tome W. A., Caine C., Corn B., Kanner A., et al. (2014). Preservation of memory with conformal avoidance of the hippocampal neural stem-cell compartment during whole-brain radiotherapy for brain metastases (RTOG 0933): A phase II multi-institutional trial. Journal of Clinical Oncology, 32(34), 3810–3816. https://doi.org/10.1200/JCO.2014.57.2909. Hatanpaa, K. J., Raisanen J. M., Herndon E., Burns D. K., Foong C., Habib A. A., et al. (2014). Hippocampal sclerosis in dementia, epilepsy, and ischemic injury: Differential vulnerability of hippocampal subfields. Journal of Neuropathology and Experimental Neurology, 73(2), 136–142. https://doi.org/10.1097/OPX.0000000000000170. Iglesias, J. E., Augustinack J. C., Nguyen K., Player C. M., Player A., Wright M., et al. (2015). A computational atlas of the hippocampal formation using ex vivo, ultra-high resolution MRI: Application to adaptive segmentation of in vivo MRI. NeuroImage, 115, 117–137. https://doi.org/10.1016/j.neuroimage.2015.04.042. Karunamuni, R., Bartsch H., White N. S., Moiseenko V., Carmona R., Marshall D. C., et al. (2016). Dose-dependent cortical thinning after partial brain irradiation in high-grade glioma. International Journal of Radiation Oncology, Biology, Physics, 94(2), 297–304. https://doi.org/10.1016/j.ijrobp.2015.10.026. Lee, N., Harris J., Garden A. S., Straube W., Glisson B., Xia P., et al. (2009). Intensity-modulated radiation therapy with or without chemotherapy for nasopharyngeal carcinoma: Radiation therapy oncology group phase II trial 0225. Journal of Clinical Oncology, 27(22), 3684–3690. https://doi.org/10.1200/JCO.2008.19.9109. Lin, J., Lv X., Niu M., Liu L., Chen J., Xie F., et al. (2017). Radiation-induced abnormal cortical thickness in patients with nasopharyngeal carcinoma after radiotherapy. NeuroImage: Clinical, 14, 610–621. https://doi.org/10.1016/j.nicl.2017.02.025. Lv, X. F., Zheng X. L., Zhang W. D., Liu L. Z., Zhang Y. M., Chen M. Y., et al. (2014). Radiation-induced changes in normal-appearing gray matter in patients with nasopharyngeal carcinoma: A magnetic resonance imaging voxel-based morphometry study. Neuroradiology, 56(5), 423–430. https://doi.org/10.1007/s00234-014-1338-y. Mao, Y. P., Zhou G. Q., Liu L. Z., Guo R., Sun Y., Li L., et al. (2014). Comparison of radiological and clinical features of temporal lobe necrosis in nasopharyngeal carcinoma patients treated with 2D radiotherapy or intensity-modulated radiotherapy. British Journal of Cancer, 110(11), 2633–2639. https://doi.org/10.1038/bjc.2014.243. Nasreddine, Z. S., Phillips N. A., Bedirian V., Charbonneau S., Whitehead V., Collin I., et al. (2005). The Montreal cognitive assessment, MoCA: A brief screening tool for mild cognitive impairment. Journal of the American Geriatrics Society, 53(4), 695–699. https://doi.org/10.1111/j.1532-5415.2005.53221.x. Pospisil, P., Kazda T., Hynkova L., Bulik M., Dobiaskova M., Burkon P., et al. (2017). Post-WBRT cognitive impairment and hippocampal neuronal depletion measured by in vivo metabolic MR spectroscopy: Results of prospective investigational study. Radiotherapy and Oncology, 122(3), 373–379. https://doi.org/10.1016/j.radonc.2016.12.013. Puspitasari, A., Koganezawa N., Ishizuka Y., Kojima N., Tanaka N., Nakano T., et al. (2016). X irradiation induces acute cognitive decline via transient synaptic dysfunction. Radiation Research, 185(4), 423–430. https://doi.org/10.1667/RR14236.1. Santos-Filho, C., de Lima C. M., Foro C. A., de Oliveira M. A., Magalhaes N. G., Guerreiro-Diniz C., et al. (2014). Visuospatial learning and memory in the Cebus apella and microglial morphology in the molecular layer of the dentate gyrus and CA1 lacunosum molecular layer. Journal of Chemical Neuroanatomy, 61-62(176–188. https://doi.org/10.1016/j.jchemneu.2014.10.001. Seibert, T. M., Karunamuni R., Bartsch H., Kaifi S., Krishnan A. P., Dalia Y., et al. (2017). 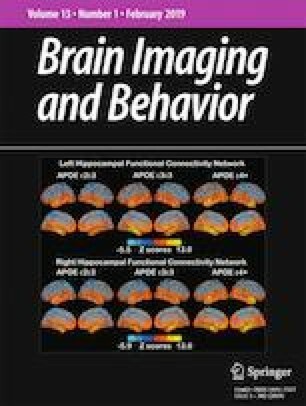 Radiation dose-dependent hippocampal atrophy detected with longitudinal volumetric magnetic resonance imaging. International Journal of Radiation Oncology, Biology, Physics, 97(2), 263–269. https://doi.org/10.1016/j.ijrobp.2016.10.035. Simo, M., Vaquero L., Ripolles P., Gurtubay-Antolin A., Jove J., Navarro A., et al. (2016). Longitudinal brain changes associated with prophylactic cranial irradiation in lung Cancer. Journal of Thoracic Oncology, 11(4), 475–486. https://doi.org/10.1016/j.jtho.2015.12.110. Sun, Y., Yu X. L., Luo W., Lee A. W., Wee J. T., Lee N., et al. (2014). Recommendation for a contouring method and atlas of organs at risk in nasopharyngeal carcinoma patients receiving intensity-modulated radiotherapy. Radiotherapy and Oncology, 110(3), 390–397. https://doi.org/10.1016/j.radonc.2013.10.035. Van Leemput, K., Bakkour A., Benner T., Wiggins G., Wald L. L., Augustinack J., et al. (2009). Automated segmentation of hippocampal subfields from ultra-high resolution in vivo MRI. Hippocampus, 19(6), 549–557. https://doi.org/10.1002/hipo.20615. Warrington, J. P., Csiszar A., Johnson D. A., Herman T. S., Ahmad S., Lee Y. W., et al. (2011). Cerebral microvascular rarefaction induced by whole brain radiation is reversible by systemic hypoxia in mice. American Journal of Physiology-Heart and Circulatory Physiology, 300(3), H736-H744. https://doi.org/10.1152/ajpheart.01024.2010. Yao, J. J., Yu X. L., Zhang F., Zhang W. J., Zhou G. Q., Tang L. L., et al. (2017). Radiotherapy with neoadjuvant chemotherapy versus concurrent chemoradiotherapy for ascending-type nasopharyngeal carcinoma: A retrospective comparison of toxicity and prognosis. Chinese Journal of Cancer, 36(1), 26. https://doi.org/10.1186/s40880-017-0195-6.